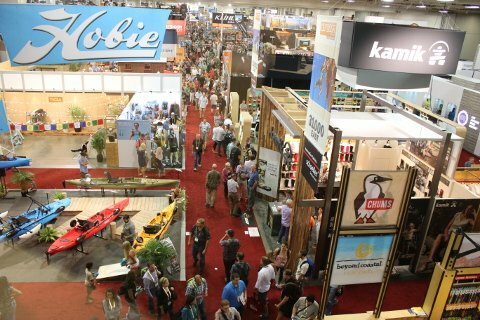 For anyone who ever thought going into nature meant escaping the world of stuff and buying more stuff then you haven’t been to the Outdoor Retailer Summer Market Convention in Salt Lake City. If there’s ever a place that made you feel you didn’t have enough possessions to make your outdoor excursions more enjoyable, it’s the 95,000 square feet of products stuffed into the Outdoor Retailer this year. This four-day celebration of every doodad, gadget and gizmo connected with the outdoors attracts retail buyers from around the world. They converge on the capital of Utah some 30,000 strong like hornets among 1,600 exhibitors, some of which erect massive two-story structures on the exhibit floor. This is where deals are made, relationships are forged and fabric is verified. After a few days walking among the madness, you become overwhelmed by a dizzying number of paddleboards and kayaks, far too many headlamps and enough cellphone charging methods to satisfy a prepper for the next 100 years. We have emerged from the chaos clear-headed, or as much as we attempt to be about what were the most compelling products. Trying to categorically say these are the best products at the show is truly impossible. So we’ll say this: The following are the top 11 things that especially caught our eye.